It's two in the afternoon and you are in your office. The phone rings and it's the emergency room of the local hospital. Your 79-year-old mother was just admitted. She was grocery shopping, and just slumped to the floor. Paramedics arrived quickly and took her to the hospital. Mom wasn't coherent, but they found a SafelyMD card in her purse. That's how they knew to call you at your office. 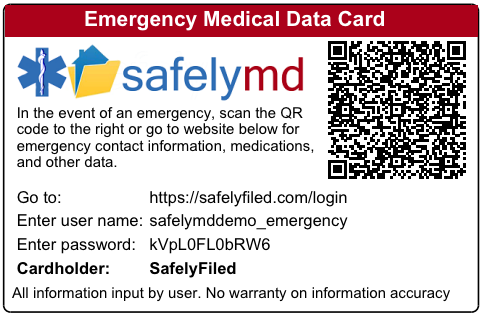 Using a tablet or smart phone with a scanning app, an emergency room nurse scanned the QR code on the SafelyMD card. That took her straight to your mom's medical info. She saw what meds mom was taking, who her doctor was and her list of contacts. The nurse first called you at home. No answer. Then your cell. No answer. Then she called you at work where you picked up. You had just started at this new company and you were glad you updated mom's contact data with the new number. By the time you arrive at the hospital, your mom's doctor had been contacted. The hospital also downloaded the healthcare power of attorney you put up on the public folders of mom's account. You have the power of attorney, so they know they can freely talk to you and you can make decisions. The emergency room staff asks you a few questions, but they got most of their important info from the SafelyMD account. You can now spend time reassuring mom and you call your brother. And because you also scanned mom's card, all you have to do is push the phone number on the contact list and the call is instantly made. You don't have to spend time looking up numbers. A few weeks ago you opened a free SafelyMD account for your mom and filled out the online form, answering questions about mom's medications, allergies and medical conditions. You were able to do it right at her house, on your tablet. It only took 10 minutes. You recorded the medications when you were standing right next to the medicine cabinet. And when you took mom to the doctor a week later and the medications were changed, you were able to update the form right away. When you update a SafelyMD account, you don't have to reprint the card. The most current data is always displayed. 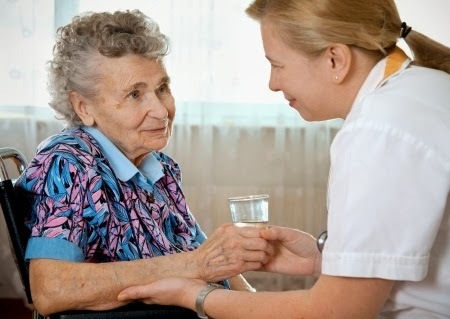 And SafelyMD creates a nice document with all of that information for you so you can download and print that out to be handed to the doctor or other caregivers who may need the information. We really hope the paramedics and emergency room personnel never have to use your mom's SafelyMD card. But the odds are they will someday. It takes only a few minutes to set up an account. It could save her life and take some of the worry out of yours. If you want a SafelyMD card for yourself, your parents and other family members, you can sign up for our full SafelyFiled service. You will then be able to manage everyone's information with one account. SafelyMD - Needed Sooner Than We Expected!